The F2012 is the fifty eighth Formula One car built by Ferrari and is named after its year of manufacture. The car was launched on February 3, after which it was immediately shipped to Jerez for its first test on Tuesday 7 Feb. The shakedown of the car that was planned after the launch at Maranello was cancelled due to snowfall. The launch itself was also simply an online one, as invites were cancelled, also because of the weather. The circumstances however didn't degrade the technical masterpiece that Ferrari designed over winter. While some argue it is an ugly car, it does feature many interesting technical bits. Ferrari had made it no secret that the arrival of Pat Fry would induce more risk taking into the design process of the Italian cars, and it easily shows at first glimpse on the F2012. Ferrari further developed the front wing that the team were testing in the final races of 2011 and fitted these with large pillars onto a wide but very thin nose cone. The pillars themselves are positioned so that the trailing edges are closer to each other compared to the leading edges. This feature was also on the F150 and speeds up air flowing in between the pillars, and helps to draw more air towards the centre of the car. The shape of the nose is mainly determined by new aerodynamic regulations which state that any car part ahead of the front wheels must not be higher than 55cm above the reference plane. With the front bulkhead designed to be as high as possible above the ground for better undercar airflow, a step-up in the nose was one of the most striking features at the launch, and likely also one of the most disliked. Most striking however is Ferrari's front pull rod suspension, a feature not seen in F1 ever since the introduction of high noses. It was deemed more practical to have a pull rod, as this could run from high on the nose to low in the upright, creating a steep angle for which it was easier to setup the suspension. 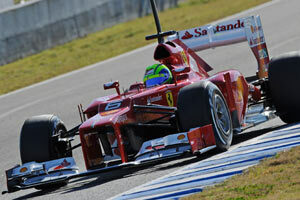 Ferrari though appears confident it can be done differently. With the main suspension arms slowing down at nearly 16°, the pull rod runs from the lowest edge of the nose to the uppermost end of the wheel's upright, creating a 10° angle for the pull rod. In essence, suspension travel will materialize by movement of the pull rod. Riding over a bump will pull the rod out of the chassis, something that is countered by the dampers and springs inside the car. Ferrari mainly hope that this will bring a performance advantage due to its lower centre of gravity, as the heaviest suspension components can now be placed low in the hub. Underneath the nose there are two turning vanes, while further to the back there are small bargeboards which all help undercar airflow. Another visually obvious change is the double airbox. The first inlet is commonly the air intake for the engine, and this time it is not different. The second air intake, positioned behind the roll hoop takes some air to cool engine or gearbox oil, thanks to a small radiator positioned above the gearbox. The sidepods meanwhile are sloping up towards the outside of the car, allowing for a better stream of air on each side of the airbox to reach the rear wing. The side impact structures have been thoroughly modified, as well as repositioning of the radiators and revisions to all aerodynamic elements. The lower part of the rear of the car is much narrower and more tapered, a feature achieved partly through a new gearbox casing and a relocation of some mechanical components. In recent years, the area of exhausts has been crucial in terms of car performance and much effort was spent on this front, based on changes to the regulations introduced this year. The rear wing is conceptually similar to the one used in 2011, but every detail of it has been revised and it is now more efficient. Naturally, it is still fitted with DRS (a drag reduction system,) which is operated hydraulically. The front and rear air intakes for the brakes have been redesigned and work was carried out in collaboration with Brembo to optimise the braking system. The engine in the F2012 is an evolution of the one that powered last year’s car, which is inevitable given that the technical regulations forbid any modification to internal components aimed at increasing performance. Other than its peak performance, engineers have also improved the installation of the engine into the chassis while th engine specialists focused on reducing performance drop off, with the aim of maintaining the highest possible performance level throughout each engine’s cycle of use, which has now reached an average life of three races. The electronic management of the engine has been revised based on the modifications to the rules regarding the use of exhaust gases, a task that has required a great deal of attention and many hours on the test bed. The kinetic energy recovery system maintains its low central location in the car – a choice also aimed at maximising safety – and has undergone an update directed mainly at reducing its weight and at improving the efficiency of some of its components. Once on track, it was obvious the team was struggling badly with the position of the exhausts. Several different layouts were tried during winter testing and early in the season. Even though it was a considerably struggle in the early part of the season - Alonso was quoted early in the season that driving the F2012 was like 'walking on a tightrope', the reliability made sure that Alonso took the lead in the drivers' championship. Ferrari however experienced a lot of correlation issues with its wind tunnel, dropping the team behind as many updates brought to the car didn't work in real life. While it forced Ferrari to close its own tunnel for a major update and continue working at Toyota's former F1 windtunnel at Cologne, the car also lost ground to its competitors and in the end was second in the constructors' championship, 60 points down on Red Bull whose Red Bull RB8 jumped ahead after a considerable aerodynamic update at the Singapore GP. The F2012 recorded 2 pole positions in the hands of Fernando Alonso, along with scoring 3 wins and a further 12 podiums.